While more organizations are working to unlock employee potential and improve performance, many remain naive or unable to put in place processes to engage their staff. According to the 533 business and human resources executives in North America, Europe and Asia-Pacific who answered the 2011 Lumesse Performance Management Assessment survey, this could indicate a need for back-to-basics performance management processes for some. However, some organizations have experienced significant improvements in employee performance. The results from these top organizations, or leaders, contrast with laggards who are experiencing little or no improvement. Leaders are more likely to implement fundamental talent management practices and to experience success. 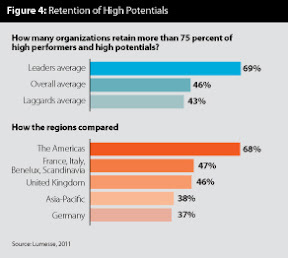 Percentages of leaders and laggards vary widely across global regions. Based on the Lumesse survey, North American companies came out on top in every basic performance management practice, while other regions had more uneven results. While the global average for leaders was 20 percent and 31 percent for laggards, organizations in North America rated higher in both with more leaders and fewer laggards. Further, 19 percent of surveyed organizations in Asia-Pacific were rated leaders and 31 percent laggards. European countries varied, and Germany was the lowest-rated country (Figure 1). Implement cascading goals: Employees and their organization should be working toward the same goals. Respondent leaders demonstrated this; almost half — 47 percent — have cascading goals for most or all employees, versus only 19 percent of laggards. Connect pay and performance: Rewarding people for contributing to an organization’s success can light the fire for performance. Among leaders, 40 percent say most or all employees are able to see a clear relationship between personal performance and compensation and benefits. Only 12 percent of laggards say the same. Measure managers on leadership effectiveness: People leave bad managers and work hard for good ones. Leaders understand this and hold their managers accountable, with 42 percent saying they measure most or all managers on leadership effectiveness. Only 12 percent of laggards do the same. Use financial metrics to create employee goals: Many organizations find it challenging to implement financial metrics for people who do not have profit/loss responsibility or do not work in sales. As a result, there is room for improvement in this category. 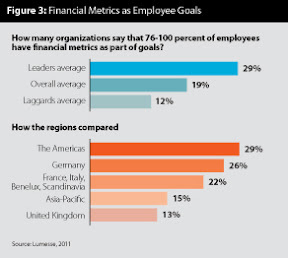 Even among leaders, only 28 percent have financial metrics as goals for most or all employees. Twelve percent of laggards can say the same. Because leaders are applying these performance management best practices, this group is more likely to retain high performers and high potentials than the laggards. More than one-third of leaders — 35 percent — retained more than 90 percent of their high performers and high potentials during the past two to five years. Only 14 percent of laggards were able to retain their best people. Adopting these practices allows organizations to consistently produce desired results and outperform the competition regardless of the business climate. To transform laggards into leaders across all regions, the Lumesse Performance Management Assessment survey results led to several recommendations. Don’t overlook goal alignment: Alignment is more than just business language. If HR professionals, and the diversity leaders who work closely with them, achieve alignment, they can improve business performance and engage their people. An organization can map its strategy, and then convert that direction to actionable goals for every employee. Employees can work toward performance targets that drive success for the organization. Managers can meet with employees to establish expectations and set clear goals. As a result, employees are engaged because they understand what they should do, how their work will be evaluated and how their day-to-day work helps the organization. Managers can track progress and offer feedback as needed, and obstacles can be overcome. Cascading goals improve enterprise agility and allow rapid course correction as needed to respond to ups and downs in business conditions, which are success drivers in talent management. Globally, 41 percent of surveyed firms in North America have cascading goals for 70 to 100 percent of employees, but slightly more than half that percentage in Asia-Pacific can say the same. Nineteen percent of laggards have cascading goals for most or all employees. Make the connection between pay and performance: For organizations that make performance management a priority, connecting pay with employee performance is key. However, 45 percent of HR practitioners cite the manager’s inability to differentiate between high and low performers as a top barrier to effective employee performance management. Only 12 percent of laggards say that most or all of their workforce can see a clear relationship between performance and compensation. Pay-for-performance discussions can be the foundation for development conversations between employees and managers. Frustration occurs when employees don’t understand how they are rewarded for their work and don’t understand what they need to do to earn more. When employees perceive remuneration decisions are based on a manager’s opinion of performance and not the achievement of measurable goals, the process can seem discriminatory and cause employees to disengage. A rewards strategy based on clear, measurable criteria that employees can strive for and achieve does the opposite. While 35 percent of those surveyed in North America say 70 to 100 percent of employees see a connection between performance and compensation and benefits, those surveyed in Europe and Asia-Pacific came in between five to 15 percentage points lower (Figure 2). Hold managers accountable for developing their people: Although cascading goals and pay for performance can provide clear direction for the manager-employee conversation, a manager must step forward and lead. Employees want and need feedback, and true performance management can’t just be a once-a-year event. It has to be an ongoing conversation in the workplace, where managers focus less on telling employees how to get things done and more on offering advice about how to accomplish goals. There is a direct relationship between good leadership and employee commitment. Great leaders attract, hire and inspire great people. A mediocre manager likely will not attract or retain a high-performing employee. The leaders understand this and hold managers accountable for results; laggards do not. Some 38 percent of those surveyed in North America say 76 to 100 percent of managers are measured on leadership effectiveness, compared to less than half of that percentage for those working in Asia-Pacific. European respondents ranged in the middle. Develop goals based on financial metrics for all employees: Some organizations believe financial metrics are only relevant to senior managers or certain roles. Many find it challenging to establish financial metrics for most or all employees. Even among the leaders, 29 percent say they use financial metrics as part of goals for a majority of employees. Only 12 percent of laggards say the same. While 29 percent of respondents in North America say that 76 to 100 percent of their employees have financial metrics as part of goals, fewer than half of that percentage in the U.K. agree (Figure 3). With clear direction and achievable goals, every employee can play a role in increasing revenue and reducing costs. While generating revenue against plan is more relevant to those in sales roles than most other areas, generating in-year efficiency savings is relevant to a wide variety of roles, including HR and diversity and inclusion. For example, a customer service representative (CSR) at a call center may not feel his or her actions could increase company market share. But if every CSR could reduce the time required to successfully resolve support center calls and improve customer satisfaction in a measurable way, that outcome is more likely. Monitor retention of top talent: The cost of turnover is often more than the price of recruitment, orienting, training and time to productivity. Retaining high-performing employees (HIPERs) and high-potential employees (HIPOs) will create organizational success. HIPERs are far more valuable to an organization than average performers, as much as three to 10 times more, depending on the job role and industry. HIPOs are crucial because they will be leaders and innovators in the future. Creating aligned goals and paying for performance can help an organization identify and reward HIPERs and HIPOs. Creating clear financial metrics for all employees can give a company’s best employees clear goals and a chance to shine. Because the leaders have implemented these measures, retention of HIPERs and HIPOs are where they see the outcome of their hard work. Once again, North America led other regions, with more than half saying their organizations retain more than 75 percent of high performers and high potentials. Asia-Pacific came in at more than half of the North American rate (Figure 4). The survey highlights the contrasts between North America, Europe and Asia-Pacific with regard to the maturity of employee performance management processes. For example, while the U.K. rated second highest for all regions in providing cascading goals, its businesses proved least effective at providing financial metrics. And while Asia-Pacific ranked second in enabling employees to see a connection between performance and compensation, its businesses are poorest at providing cascading goals and measuring the majority of managers on leadership effectiveness. These differences may pose a challenge for global organizations. Achieving results from performance management doesn’t happen by accident. Organizations that develop leaders recognize this instinctively. As organizations get ready for better days, now is the time to prepare their performance programs and their people. Success is a journey, not a destination. The goal is to help all employees, managers and the organization to continuously improve and reach their full potential regardless of where in the world they are located.